At Lady Decorators we extend our meticulous interior decorating service to hand-painting kitchens, breathing new life into them. 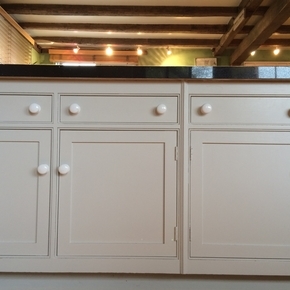 The transformative effect of a beautifully prepared and flawlessly painted kitchen cannot be underestimated and it is also a very cost-effective way of getting more mileage out of your kitchen cabinets: we paint old wood and laminate units to take them from so-so to sublime! 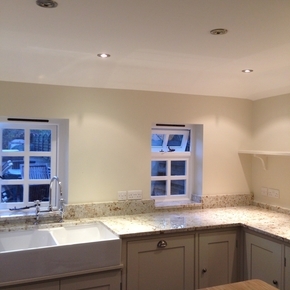 Scrupulous prep is the key to a pristine finish, when it comes to painting a kitchen. 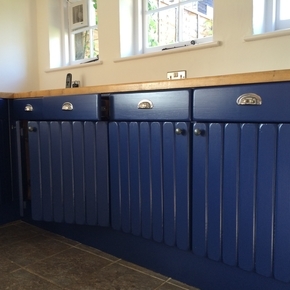 We de-grease surfaces using specialist products and sand down using professional power sanders with dust-free extraction; we remove handles, hinges and fittings before applying primers and stain treatments and at least two finishing top coats are then carefully applied in the client's chosen colour. Then we of course re-fit handles, hinges and re-hang doors. 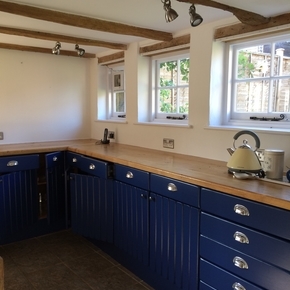 We are on hand at every stage and, not only will we keep disruption and mess to a minimum, we will be happy to offer the benefit of our advice on choosing colours and surface finishes for your hand-painted kitchen. 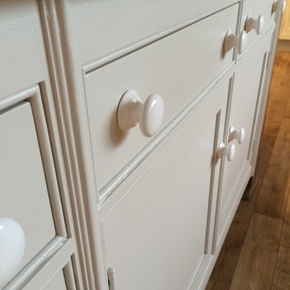 Good paint brands which we recommend for kitchen painting include Little Greene, Mythic and Tikkurila.